Their breed standard calls for a weight of 75 to 85 pounds (34-38.5 kg) and a height of 23 to 25 inches (58-63.5 cm) but much heavier individuals (120 to 140 pounds) are commonly seen. The coat is a dense double northern dog coat, somewhat harsher than that of the Siberian Husky. The usual colours are various shades of grey and white, sable and white, black and white, red and white, or pure white. The physical build of the Malamute is compact with heavy boning. In this context 'compact' means that their height to length ratio is fairly even, unlike dogs like Great Danes which are longer and lankier in their ratios. Malamutes are easily distinguished from Huskies by eye color; Malamute eyes are always brown, whereas Huskies may have one or two blue eyes. 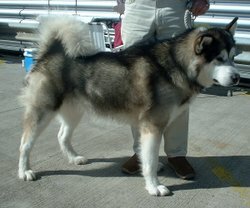 Although still in use as sleddogs for recreational mushing, most Malamutes today are kept as family pets or show dogs. They are unable to compete successfully even in long-distance dogsled racing against smaller and faster breeds and their working usefulness is limited to freighting. The Malamute is one of the most "unaltered" of breeds, retaining its original form and function. 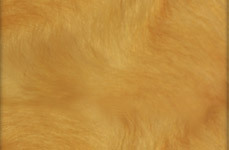 Responsible breeders will want to preserve this heritage of the Malamute's working abilities. They are a widely regarded as handsome, affectionate toward humans, intelligent, resourceful, and hardworking. While they may bark like other dog breeds, Malamutes normally tend to "talk" by vocalizing a "woo woo" sound. They may howl like wolves or coyotes when feeling excited, sad, or lonely. Understanding Malamute behavior requires understanding life in an aboriginal Arctic village. Malamutes were originally bred to think and act independently for the sake of protecting the sled team. Hazardous and unpredictable Arctic trail conditions rewarded the ability of a Malamute to rely on its own senses and, when necessary, override the sled driver's judgment and commands. As such, the breed is notorious for displaying a highly independent streak that manifests itself as stubbornness. Malamutes are sometimes downright insubordinate toward their human handlers and may ignore commands, particularly when young. At the same time, Arctic life required that Malamutes be bred to behave as consummate members of the sled team, family, and village community. As such, they are usually very affectionate to members of their own pack - both human and dog members alike. A Malamute may talk in glee in greeting a returning family or pack member after a period of separation, and howl in protest when it feels ignored, neglected, or excluded from group activities. Also, Malamutes are usually friendly to other humans outside their own pack, often demanding their attention and affection as well. The Malamute's gregariousness and tendency to openly, unreservedly give affection make them highly attractive to many dog owners; these same qualities make a Malamute a poor guard dog. Prices current as of last update, 04/18/19 10:21am.